Recently Jafrum.com contacted us with some updates on motorcycle gear technology, all of the Latest and Greatest. Batteries are getting bigger, better, and more durable. October 16th marked the release of LFX19A4, a technology never before produced by Shorai. Describing them as “bigger” is figurative, though. They produce significantly more power, just the fact that the LFX19A4 is a lithium battery shows its innovation, in fact. Lithium motorcycle batteries are still a relatively new advancement, but they provide several benefits. They are known to have a much longer battery life and drain more slowly than other types of batteries, which is a key factor in motorcyclists’ decision in purchasing a battery. They have a higher energy density which allows for more power in a smaller, lighter design. Generally traditional lead-acid batteries can be substituted for a lithium battery without any form of modification. progress is being made. Initially designed for the military, they are now being adapted for commercial distribution. Helmets like the recently announced Skully P1 include features like a rear-view and blind spot camera system, visual GPS, and smartphone integration. Like most HUD helmets, the P1 is still in developmental phases, but it is expected to appear in the market in 2014. Skully is looking for beta-testers for research prior to its release. In the age of technology, we are relying on our smartphones more and more. There are all sorts of accessories designed to keep us connected with our phones while riding. The HUD helmet is still a little way off, but many of its features are available through motorcycle Bluetooth intercom systems. 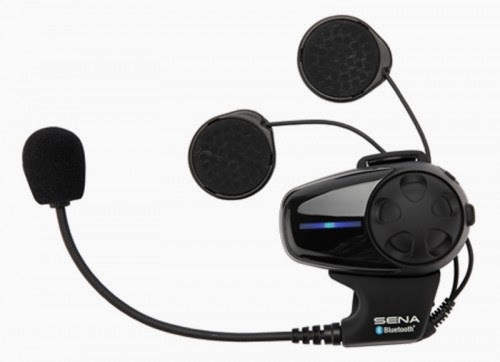 These headsets allow intercom with up to four people, voice prompting, and music. They also allow voice instructions for GPS. They have all of the audio features of the HUD helmets, they are just lacking the visual aspect. Dashboard mounts are another popular motorcycle smartphone accessory. The mount allows you to see your phone for GPS and radio purposes. These leave something to be desired however because it can be difficult to see and control the device while also paying attention to the road. Products designed to keep riders comfortable are also seeing improvements. While the idea of heating and cooling jackets and pants are not new, they are quickly seeing advancements. For spring and fall, sometimes a simple liner can be sufficient, but when it gets cold, electric gear is preferred. Brands like FirstGear are fighting to keep their gear lightweight and temperature-neutral so that it can be worn comfortably even when it is not being used. They are also being developed to be smaller and less bulky so they can be worn throughout the day. Huge technology advances like the HUD helmets are great, but even little changes allow us to be more comfortable and efficient in our everyday riding. Morgan Sansotta is a freelance writer working with Jafrum.com. On her free time she enjoys testing new gear and getting lost on long stretches of highway.